The long awaited and epic, historical film ‘Padmaavat’ has arrived! Sanjay Leela Bhansali’s scandalous magnum opus features some of Bollywood greatest talents, and is a feature follow up to his massively successful, ‘Bajirao Mastani’. Does ‘Padmaavat’ live up to its hype? Find out in this Spoiler-Free Movie Review. ‘Padmaavat’ is film that is brilliantly directed and acted, but some confounding elements take away from the story. ‘Padmaavat’ is based on a poem about a feud between two kingdoms, due to the beauty and grace of a queen, Rani Padmavati (Deepika Padukone). The story, features a brutal Muslim conqueror Alauddin, (Ranveer Singh) an enthusiast of having all that is unique in the world, and his desire to claim Padmavati’s mythical beauty as part of his harem. Thus, he wages war on her kingdom, wherein her husband, Ratan Singh (Shahid Kapoor) must defend her honour, as well as his kingdom. The film itself, written and directed by Sanjay Leela Bhansali, has all the trappings of a master piece, like his previous period films. The grandness of the setting, the authenticity (as far as I can tell) of the time period, and the strength of the performances really makes ‘Padmaavat’ stand out. But is any less expected of the filmmakers and the actors involved? At its heart, ‘Padmaavat’ is about pride, obsession and sacrifice. A story where difference in ideologies clash, but the code of honour that prevails is the one of righteous morality, and the true path to salvation. Or rather, that’s what we’re meant to believe. ‘Padmaavat’ does a fair job of creating an atmosphere reflective of its time, where honour is of utmost importance, and death is preferred over dishonour. The film establishes that principles and morals mustn’t be undermined, no matter what the cost. However, the opposite message is also conveyed, through Alauddin. And this is what gives me the most problems. Alauddin is the true antagonist of ‘Padmaavat’. Not supporting actor. Not parallel lead hero. He does not even play a villain that is humanized, or whose actions can be justified. He is an all out villain, to be hated and despised. And Ranveer Singh does this to perfection. The film is entirely Singh’s, as he stands tall in his performance of a repulsive man, whose actions are as dark as his entire core. Singh’s performance as Alauddin will definitely be etched into cinematic history when it comes to iconic Bollywood villains. The weird part of ‘Padmaavat’, however, is how much focus the villain gets. Singh’s Alauddin, is given equal significance, and if not more so, than that of Kapoor’s Ratan Singh or Padukone’s (formerly titular) Padmavati. This is most confounding element of ‘Padmaavat’. The fact the villain gets so much importance in a story that should have nothing to do with him. Antagonists are often given prominence, or a backstory in order to be humanized or to tragically justify their actions and behaviours. Scorned lover. Terrible parents. Traumatic past. Something. Alauddin however, is just plain evil. From the get-go. So why the majority of the film focuses on his life, his motivations, his thoughts and feelings is confounding! And inevitably, as mostly happens in Bollywood movies with multiple mainstream heroes, someone got the shaft! And in ‘Padmaavat’, that happens to be Shahid Kapoor. Kapoor’s Ratan Singh’s motivations are poorly handled by the writers Prakash Kapadia and Bhansali himself. Ratan Singh’s only contribution to the story is to react to situations and occurrences that are driven by Alauddin. Kapoor is excellent when he is on screen, and gives a performance that betrays a maturity that a lot of his prior roles have failed to do. Even Padmavati herself, Padukone gives a great performance, but one that falls short of roles in films like ‘Piku’. Padukone spends majority of the film having her beauty or brains praised, but truly shines in moments where she has to act out of a desire to protect her husband. ‘Padmaavat’ feels like a movie that’s been made in a bizarro universe, where the villain is depicted as the hero of the story, at least in screen time and focus of the film. ‘Padmaavat’ is not Bhansali’s best. There are many elements of the story, plot points that ultimately feel forced and there to serve the next part of the story, than anything that happens organically. 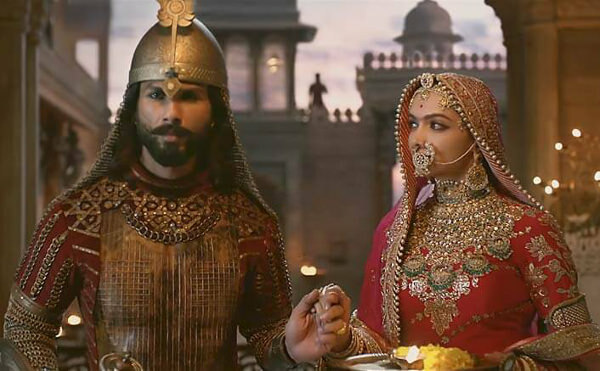 Bhansali’s insistence on historical accuracy, robs ‘Padmaavat’ of any originality, or creative liberties with the film to make for more effective storytelling. There is also the problematic ending. The story of Rani Padmavati is one of Jauhar. An act that sees women of a kingdom, collective throw themselves upon a fiery end, in order to prevent being captured or raped at the hands of the enemy. ‘Padmaavat’ portrays this act, not as the tragedy that it should be, but as a glorious and honourable act to be praised and commended. Something that is incomprehensible and conveys an entirely problematic to audiences. Especially given that the film does not, anywhere else during its 2 hour 45 minute run time, ever try to acknowledge this act as a terrible thing that desperate women do at a time when they have no other option. It doesn’t feel like a last resort, but a go-to solution. ‘Padmaavat’ is also a movie of infinite build up. The film spends a lot of time building up to things that have little to no pay out. It’s an exercise in futility as we’re always headed somewhere, but the destination is disappointing and doesn’t feel worth the trip. This is Bhansali’s worst film. But I can’t help but wonder how much of that fact is more due to the duress the filmmaker was under during the entire making of this film, because of outside influences. ‘Padmaavat’ on the surface looks good, is performed better, but all as part of a story that underserves the actors, is inconsistent with its world building, and has little to no engagement as a dramatic story.